Weekly initial unemployment claims fell to the Lowest level Since 1973, perhaps distorted by auto retooling summer shutdowns, or lack thereof. The number of Americans filing new applications for unemployment benefits last week dropped to its lowest level in more than 41-1/2 years, suggesting the labor market maintained a sturdy pace of job growth in July. nitial claims for state unemployment benefits fell 26,000 to a seasonally adjusted 255,000 for the week ended July 18, the lowest level since November 1973, the Labor Department said. However, last week's drop likely exaggerates the strength of the labor market as claims are volatile during summer when automakers usually shut assembly plants for annual retooling. "We believe that retooling shutdowns were likely much smaller in 2015 than in previous years due to lower auto inventories and very strong vehicle sales," said Cheng Chen, an economist at TD Securities in New York. That last line is interesting. A rise of less than a tenth of a percent after five straight months of negative readings hardly seems worth crowing about. Bloomberg Econoday had this to say on today's Weekly Claims Report. Auto retooling, and related temporary layoffs, is always a major wildcard for jobless claims in July and are likely at play in a startling 26,000 fall in initial claims in the July 18 week to a 42-year low of 255,000. A look at the 4-week average, which helps smooth out volatility, is less startling, down 4,000 to a 278,500 level that is little changed from the month-ago comparison. Continuing data, where data lag by a week, also fell, down 9,000 to a new multi-year low of 2.207 million with the 4-week average down 10,000 to a 2.254 million level that is also little changed from a month ago. The unemployment rate for insured workers is steady at a very low 1.6 percent. This report will raise talk of an upside surprise for the monthly employment for July where the sample week is the same as that for the latest initial claims data. 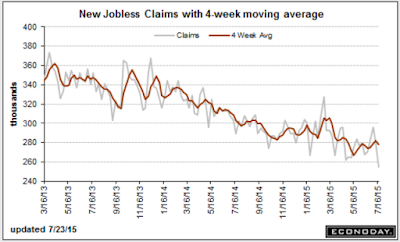 Nevertheless, jobless claims data are hard to read at this time of year and there's no guarantee of similar strength for the monthly report. Economists are now upbeat about the July Jobs report due out on August 7. We will find out soon enough.